If you’ve ever put together a jigsaw puzzle or built with Legos, you might understand the importance of the corner piece—it helps assemble the puzzle and link sets of blocks. Elbows and knees function similarly within the human body. Biochemically, University of California San Diego researchers created something like it, too—an architectural joint made from nucleic acid. Now imagine a puzzle or a set of Legos that assembles a complex structure, by itself, with only a shake of the box. Combining the biomolecules DNA and RNA, UC San Diego’s Thomas Hermann and his graduate students Alba Monferrer and Douglas Zhang created robust modules that facilitate the self-assembly of polygonal nanoshapes—really tiny triangles, squares, pentagons and hexagons measured at the nanometer scale. Their findings reported in a recent issue of Nature Communications could apply to the manufacture of self-assembling nanomaterials and to the creation of environmentally responsive sensors. This could lead to new methods for making nanoscale devices and more economically efficient, medical, point-of-care diagnostics for rapid bedside testing. To visualize a nanometer, picture a sheet of paper, which is approximately 100,000 nanometers thick … or a strand of hair from your head, which is between 80,000 and 100,000 nanometers wide … or consider that there are more than 25,400,000 nanometers in one inch. Really tiny. As another point of reference, current smartphones operate with silicon chips that contain electronic circuits measuring just above 10 nanometers. Achieving sub-10, nanometer-sized nanostructures would mark a scientific breakthrough, and the findings of Hermann’s group are within that scope. The work by Hermann and his research colleagues essentially offers a toolkit for the systematic development of programmable nanoshape platforms that could be applied to molecular recognition, sensor and catalyst development, and protein interaction studies. 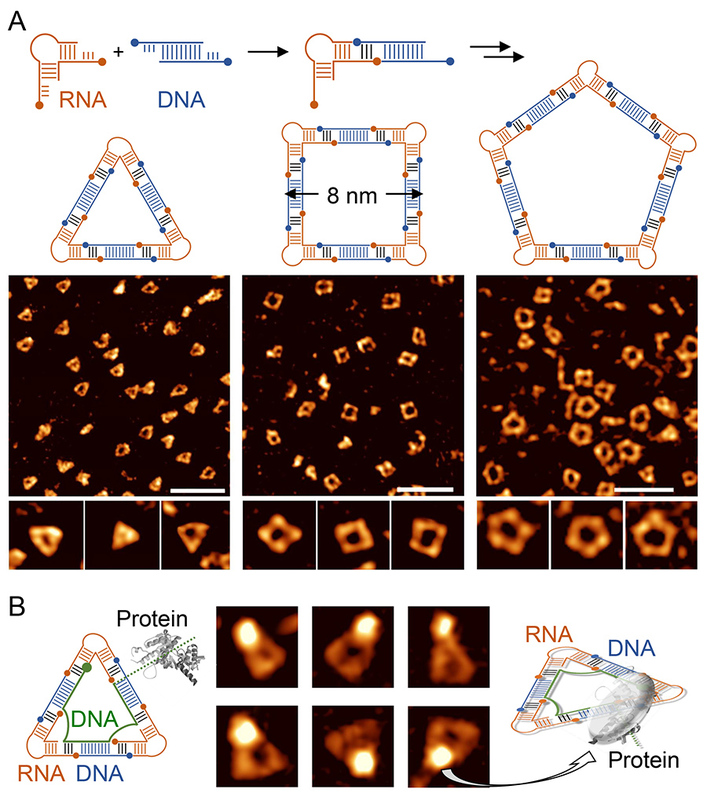 The ability to program interactions between nucleic acid modules through base-pairing of DNA and RNA is foundational to the researchers’ approach of additive manufacturing for nanoscale materials. Hermann noted that DNA serves as a blueprint, a single copy of a valuable map instructing all processes in every cell. Copies of it are made by RNA, which of the two biomolecules is more labile—ephemeral—and, in addition, can engage and adopt a diverse range of structures relative to the stability DNA provides. Using soft materials like DNA and RNA for nanotechnology is cutting-edge science. In fact, Hermann recently returned from organizing and chairing the 2019 Gordon Research Conference (GRC) on RNA Nanotechnology—only the third meeting in a biennial series covering the timely topic since 2015. The conference promotes scientific exchange and interdisciplinary collaboration among researchers working in diverse fields, ranging from chemistry and biophysics of nucleic acids to biology, medicine and materials sciences. This study was supported by the National Science Foundation, Chemical Measurement & Imaging Program (grant CHE CMI 16082870 to Thomas Hermann); a Catalan Fundació Joan Riera i Gubau Fellowship to Alba Monferrer and a pre-doctoral fellowship to Douglas Zhang by the UC San Diego Molecular Biophysics Training Grant (NIH T32 GM008326).